Step 1: First, choose your wood for your shelves. We used pine stair treads each measuring 48″ long x 11 1/2″ wide x 1″ thick. We cut each tread down to the length that worked for our space. We bought 5 treads to make 5 shelves. In all four corners of each shelf drill a hole using a spade bit. 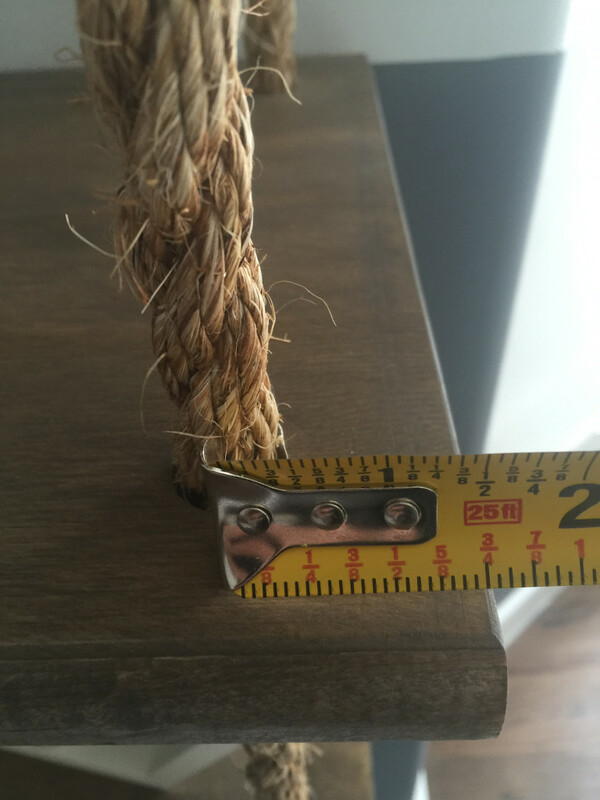 We measured 1 3/4” in at the corners and drilled a 7/8″ hole to accommodate our 3/4″ manilla rope. Step 2: Stain the shelves. First, we applied a wood conditioner that will allow the stain to penetrate more evenly. After applying the conditioner we applied our custom stain. 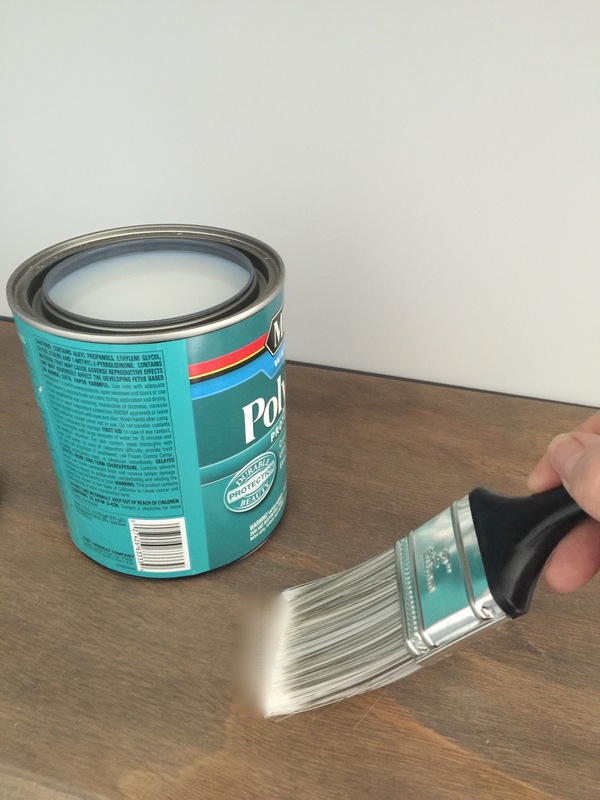 To create our custom stain we combined Minwax’s Dark Walnut, Classic Gray, and Weathered Oak in a glass jar. We applied this stain mixture using an old cotton t-shirt while wearing protective gloves. We were happy with the color after only one coat of stain but if you want a deeper color you can apply a second coat. We let the stain dry according to the directions on the can. After it was dry we applied a coat of water-based polyurethane in a satin finish using a paint brush. We again waited the appropriate time to allow it to dry. In between topcoats we lightly sanded with 220 grit sand paper to get a smooth finish. In total we applied 2 coats of polyurethane. 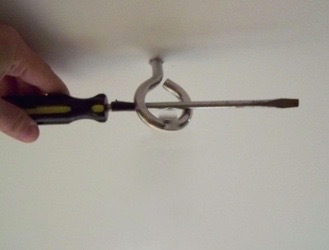 Step 3: While the shelves were drying we hung our screw eye hooks. When choosing your eye hooks choose one that will support both the weight of your hanging book case and anything that sits on the shelves. You also want the eye hook to be long enough to go through the drywall and far enough into the joist or stud to adequately hold the shelves. For our shelves we chose 2 eye hooks that had a weight capacity of 250 lbs each which was more than enough for this application. We wanted the location of the eye hooks on our ceiling to be centered on the depth of the shelf so we measured 5 3/4″ from the wall (half the depth of the 11 1/2″ shelf). Then using a stud finder we located the joists in the ceiling. 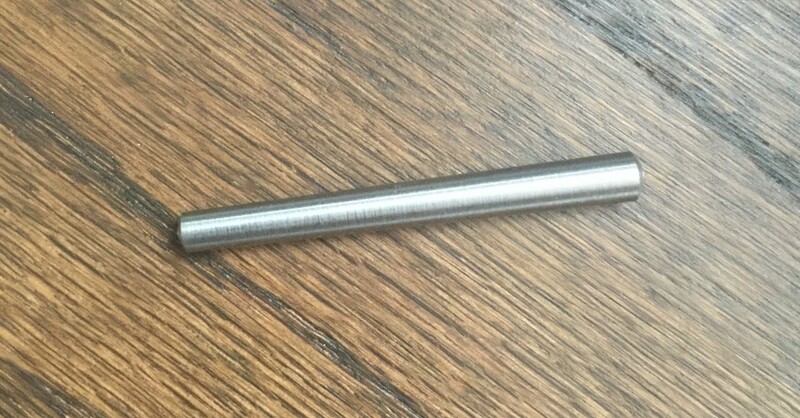 Once these were located we pre-drilled a hole slightly smaller than the diameter of our eye hook. We then screwed the two eye hooks into the center of the joists. 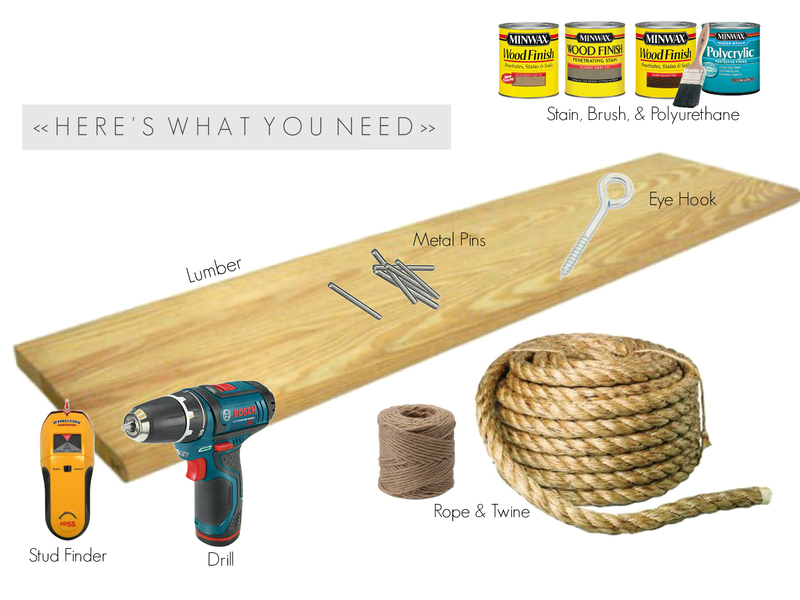 You will want to ideally screw your hooks directly into a joist or stud. If you cannot locate a joist or stud you will need a heavy duty toggle bolt. 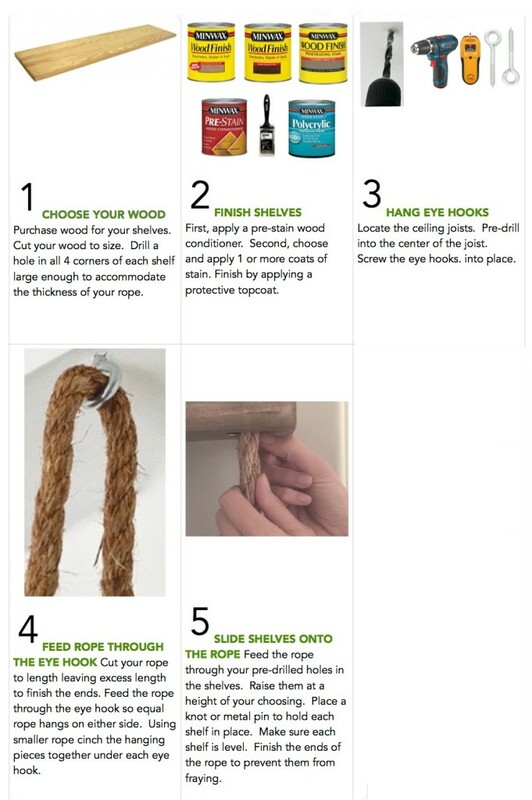 Step 4: We fed our 3/4″ manilla rope that we bought at a local hardware store through the eye hook leaving equal length of rope on either side. We bought enough length to have excess rope below the bottom shelf. 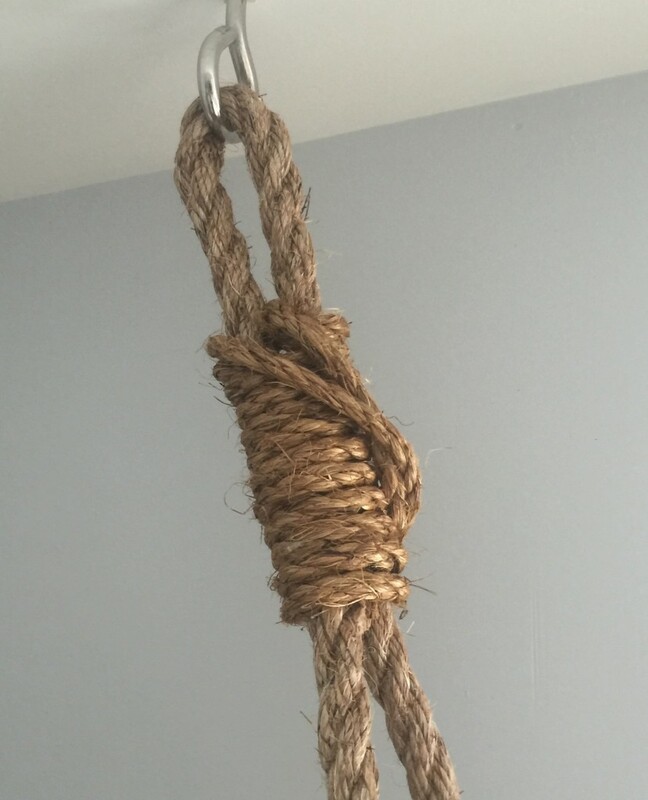 The ceilings for our project were 8’ high and our bottom shelf hung several inches above the floor therefore we chose to buy 14’ of rope per eye hook. 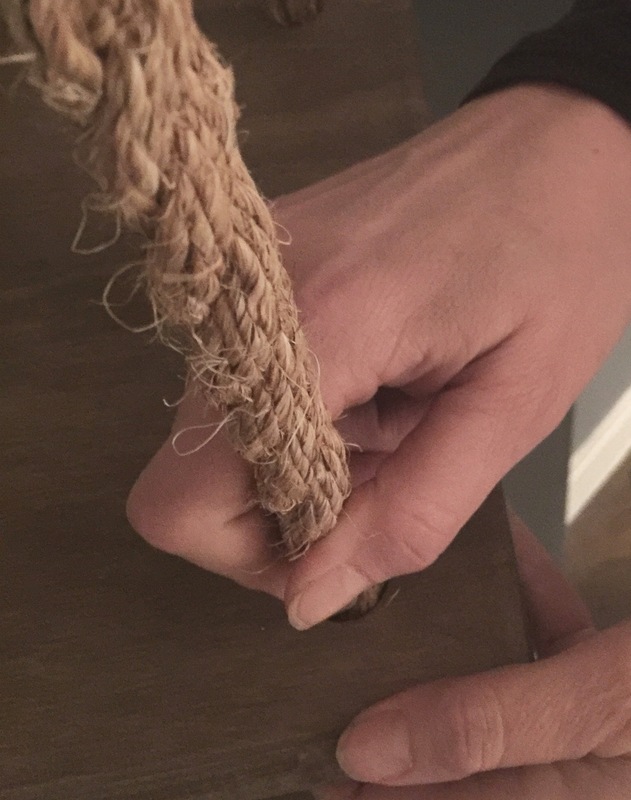 Just below the eye hook we cinched together the 3/4″ hanging rope wrapping 1/4″ thick rope around it. This not only looks good but it will also help the bookcase hang straight. Step 5: We fed the rope through our predrilled holes in our shelves raising each shelf to the height we wanted. We chose to place our bottom shelf at 15 1/2″ off the floor. We then spaced each of our shelves approximately 14″ apart leaving the top shelf 20″ from the ceiling. Under each shelf we slipped a metal rod through the rope preventing the shelf from sliding down. An alternative to this would be to tie a knot in your rope below each shelf. We opted to use pins to support the shelves so that we could adjust the height of the shelves after the bookcase was installed if we needed to. We used a level to make sure each shelf was straight. 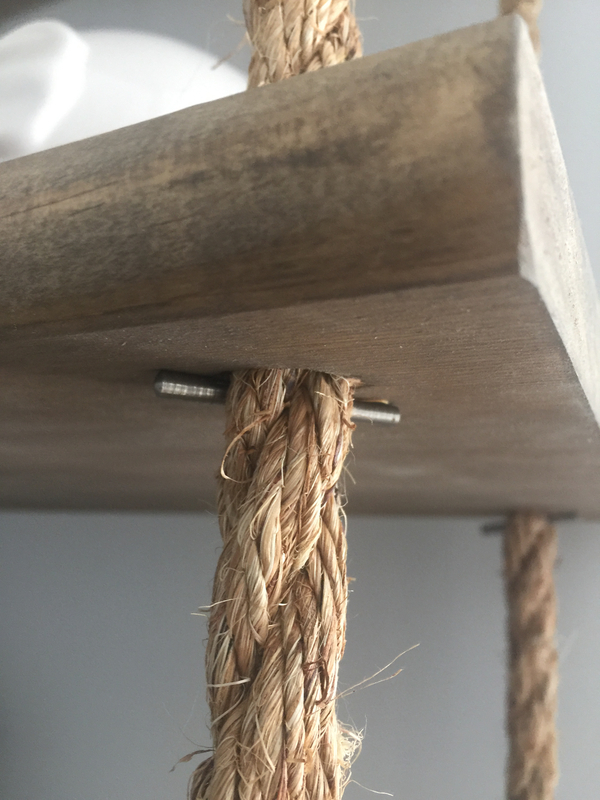 Below the bottom shelf in addition to the metal pin you could either tie a knot in the rope or whip the ends preventing them from fraying. 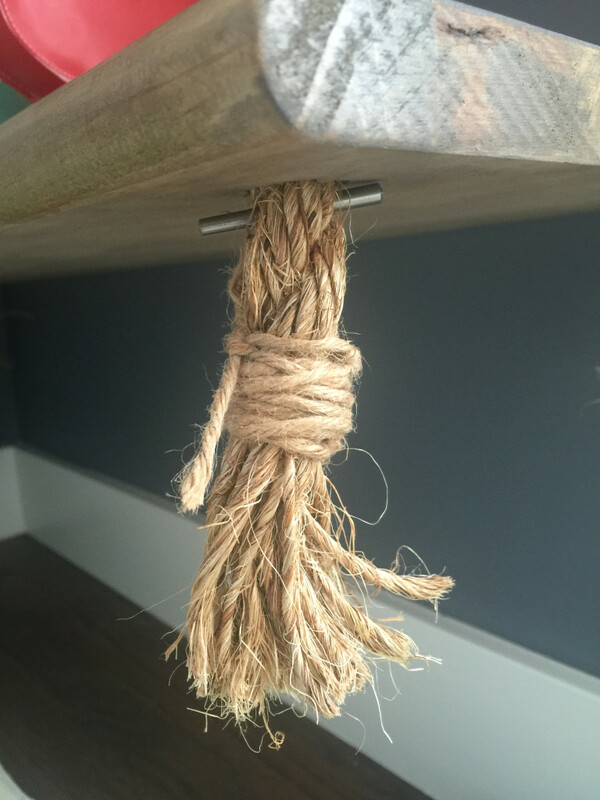 We chose to whip the end of our rope using jute twine allowing our ends to hang straight to the floor. That’s it! Now for the fun of loading your book case. 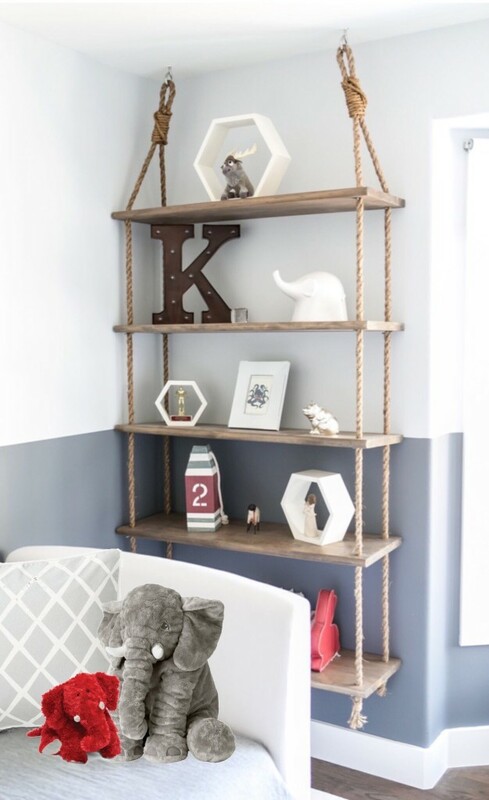 There are endless possibilities on how to stage these shelves. So get creative and have fun!